Horizons is an Equal Opportunity Employer. sSend resume to: Horizons Construction Company International, Inc. @ 1173 N. Patt Street, Anaheim, CA 92801. 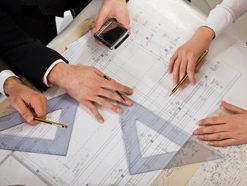 Plan, design & oversee construction of building foundations including: design of drainage system. Test soil & mineral compositions to determine the safest, highest quality & cost effective foundational structures for project. Perform structural analysis of plans & structures & ensure it meets estimated load requirements. Requirements: Bachelor of Science in Civil Engineering, Construction, Geology or foreign equivalent. 40 hr/wk. Job/Interview Site: Anaheim, CA. completed on time and on schedule. As part of this team you will be responsible for safety and quality. At least 2 years experience utilizing the following skills in Commercial Projects. Use of basic MS Office Applications. relationship with sub trades and clients. 3 to 5 years of experience utilizing the following skills in Commercial Projects. Strong use of industry related applications.